The story is being picked up internet-wide. 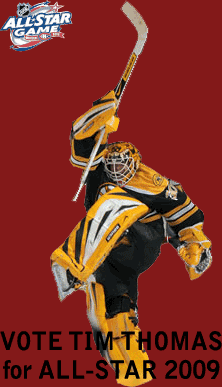 Tim Thomas has been robbed, just like he's done to so many shooters. Ba-ZING! BruinsBlog: Shawn Thornton says "He should campaign." bruins.nhl.com: Ward says "This is just another challenge to be overrun by 'The Tank'"
HubHockey: has already been mentioned, but they made the kickass graphic you're seeing to your left. WEEI's Joe Haggarty: Claude Julien says "There are bigger things for Timmy to worry about"
Hockey Journal: Thomas says "I think I’ve been underestimated"
Puck Daddy: led with Thomas on the relevant post, despite snubbing Thomas after his back-to-back shutouts on his daily three stars post. I only bring it up because Puck Daddy is so consistently solid otherwise.